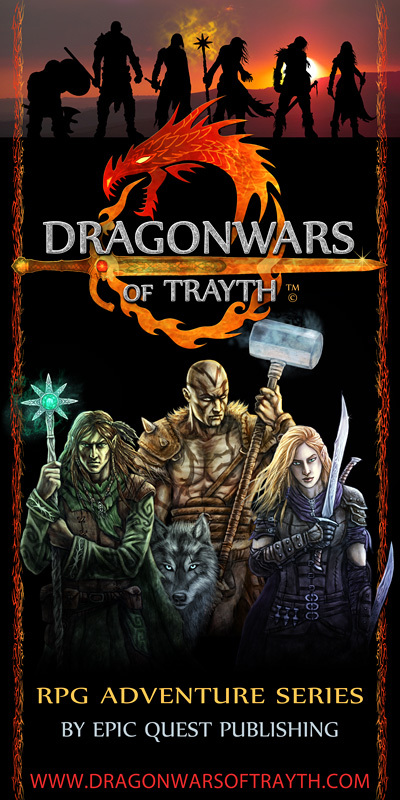 The DRAGONWARS of TRAYTH is a new campaign setting compatible with the Pathfinder Role Playing Game system. The fully detailed Campaign contains 25 modules, the Cities of Kadar game supplement, a Campaign Guide , and Players Guide for the World of Kadar campaign setting. Start your adventure at 1st level and continue it through 30th level. See our MODULE page for more details. Interact with heroes both legendary and new, parley with dragons and deities alike. Help to save a continent at war and preserve what is left of demi-humanity, and in the process you will transform from a fledgling hero into a powerful epic legend of your own. For GM’s who value attention to detail, storylines that flow nicely and make sense, sub-plots, intrigue, mystery, originality, and ease of play then this is for you. Your players will remember every part of this adventure and be talking about the quests for years to come. With over 3,000 hours of testplaying THIS campaign is the “Greatest RPG Adventure ever played” according to over 50 play-testers. Bursting with challenging encounters, riddles, skill tests, and a fully integrated story-line. The lead designer and author has over 35 years of D & D experience and has played since the original box set. The co-designers have over 20 years experience and the artists and their work brings back the quality that many other publishers sacrifice in their quest for more profit. THIS campaign brings players back to what RPG is all about. To be PART of the adventure and story and enjoy the fellowship of other gamers as you unravel the mysteries that even gaming experts called ‘Awesome”, “Expertly Detailed” and “Unforgettable”. So if you are tired of the level grinding with no purpose, having characters with nowhere to find more adventure, retiring before their time, or buying yet another version (and awaiting its inevitable demise) of the beloved RPG that didn’t need another version then here is the solution. Your wait is over DRAGONWARS OF TRAYTH is available NOW to fill the void of mediocrity in game design with high quality adventure. 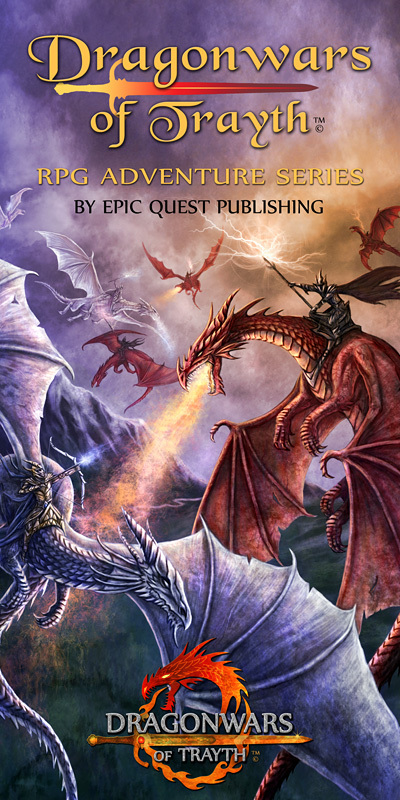 Dragonwars of Trayth and its logo’s are trademarks of Epic Quest Publishing, LLC Copyright 2014. All images copyrighted 2014. All rights reserved.